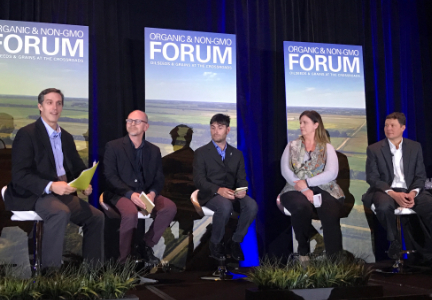 A panel discussion during the forum focused on the challenges in the field and marketplace in transitioning to organic. | Photos courtesy of Susan Reidy. ST. LOUIS, MISSOURI, U.S. – It’s time for the organic and non-GMO industry to invest in infrastructure to straighten the current “crooked” supply chain, said Eric Jackson, chief executive officer of Pipeline Foods. 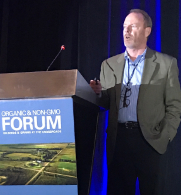 “We think it’s time to grow up as an industry and get after the elephant in the room, which is invest, put money into the infrastructure,” Jackson said in his presentation at the Organic & Non-GMO Forum in St. Louis, Missouri, U.S., on Nov. 6. The two-day event continues on Nov. 7. While it’s not the same size as conventional commodity markets, there is an opportunity to invest $300 million to $500 million in the organic and non-GMO space over the next three to five years, he said. Pipeline estimates there are less than 200 facilities that are certified for organic grain and oilseeds. Only about 50% of those are on rail and only 50% are of commercial scale. Eric Jackson, chief executive officer of Pipeline Foods. With the organic and non-GMO market there’s an opportunity to create a shared value approach, which is a new concept in commodities, Jackson said. A hub supply chain, similar to the conventional marketplace, would allow for a high degree of traceability and much lower operating expenses. Infrastructure improvements aren’t just needed for moving domestic product but also to handle imports. The United States doesn’t produce enough organic and non-GMO grain and oilseeds to meet current demand so imports are needed. Jackson said about 75% of organic products consumed in the United States are imported. Millions of acres domestically need to be converted to organic acres in order to meet the projected 15% annual growth rate in the next 10 years. During a panel discussion at the forum, Nathaniel Lewis, farm policy director, Organic Trade Association, said it’s difficult to get statistics on acreage that is in the process of transitioning into organic or non-GMO acres. Acreage must go through a three-year period free of prohibited substances such as pesticides and fertilizers before it can be certified organic. A 2015 survey showed that 150,000 acres, of which 141,000 acres are cropland, are in transition. Those acres are spread over about 1,500 farms. To help, the Organic Trade Association is working to tweak existing policies and programs to address the unique needs of organic farmers, he said. Enforcement presents another challenge for the organic and non-GMO industry, Jackson said.